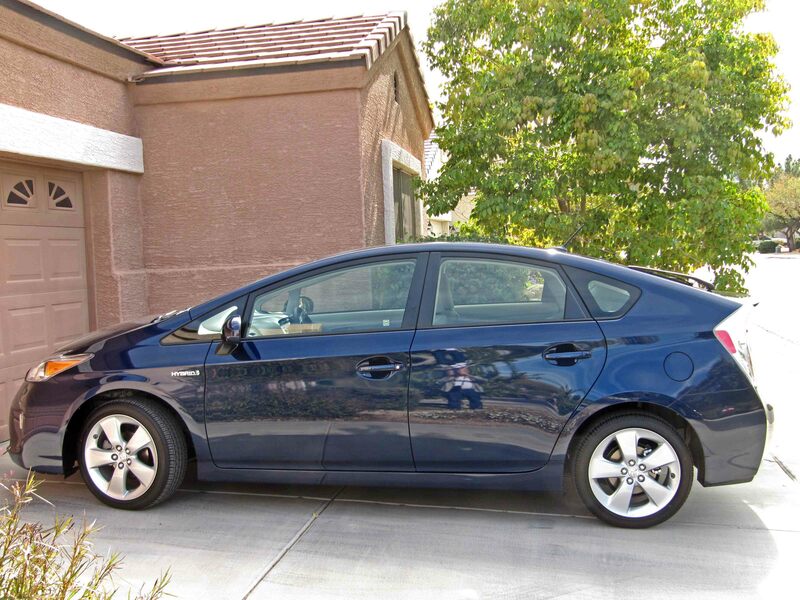 Although we went to a nearby Toyota dealer only to look and test drive a Prius 5, we traded in our 2005 Audi TT and drove home in a new Nautical Blue Prius 5. We are excited to drive an environmentally friendly vehicle that is advertised to operate at 50 miles per gallon of gas. We discovered that Prius models 2 through 5 have the same engine but vary according to trim packages. The Prius 5 has 17 inch 5-spoke alloy wheels whereas other models have 15 inch tires. Our leather seats include heated front seats and an 8-way power adjustable driver’s seat. It has LED headlamps with auto level control, auto on/off headlamp cleaners and integrated fog lamps. I’m especially interested in exploring the complimentary 3-year Entune system. By connecting my smartphone, I not only have a hands-free phone but can stream my own music via Bluetooth and access both Bing and Pandora with more services to expected come up soon. Toyota provides their Safety Connect service and will cover all maintenance costs for our first five 5,000 mile service visits. Our purchase should also help in improving the economy. We’re looking to many years of happy driving. The Phoenix Symphony participated in the Arizona centennial celebration with a unique evening of music. Like Music Director and Conductor Michael Christie, I wore a bolo tie, Arizona’s official neckware. Frede Grofe’s Grand Canyon Suite included photo-choreography by James Westwater and Nicholas Bardonnay. Three large screens were lowered on the front of the stage with the orchestra positioned farther back than is customary but still visible. Large, masterful pictures were posted on each screen. Sometimes two screens were used for a panorama and other times all three screens were used. The quality of the pictures was superb. Of course, the visual presentation fit the music itself. Great views from atop both the south and north rims were used as well as footage from the Colorado River and its banks. Footage from the Williams’ rodeo, horseshoe bend and the slot canyons near Page augmented the show. Nicholas Bardonnay is James Westwaters son-in-law. They were commissioned for this work by the Tucson Symphony and the Phoenix Symphony and spent about a month and a half putting it together. The only criticism was that Grofe’s work was edited down to about twenty minutes. The concert started with Aaron Copeland’s Lincoln Portrait narrated by local resident Hugh Downs. This was an appropriate way to remember Abraham Lincoln on Presidents’ Day Weekend. The second half of the concert featured Antonin Dvorak’s Symphony No. 9 in E minor, Opus 95. This piece, commonly known as From the New World, incorporates African American and Native American themes with Dvorak’s special gift for melodies. Saturday evening’s performance was a fine cultural contribution recognizing 100 years of Arizona statehood. Arizona celebrates its statehood centennial on February 14th. 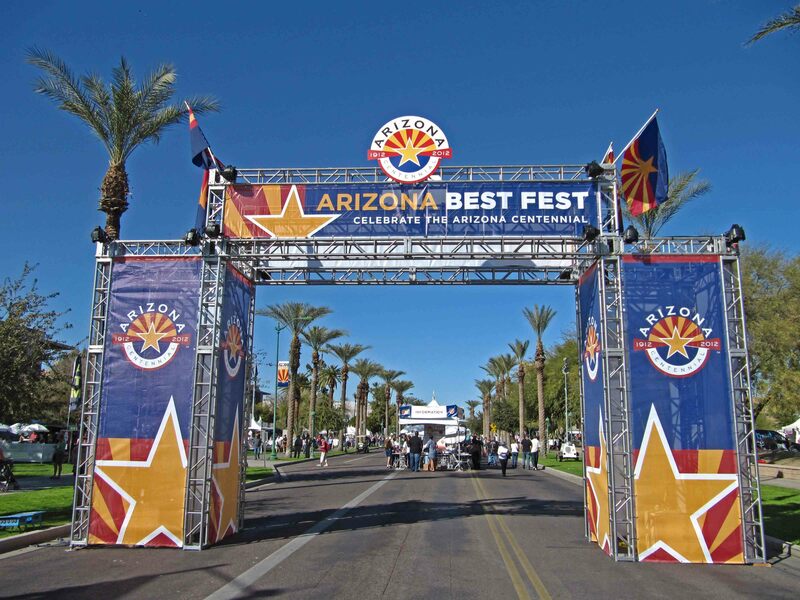 This weekend the third Arizona Best Fest came to Phoenix after previous stops in Prescoot and Tuscon. The Sunday Arizona Republic reported “More than 60,000 people visited the state Capitol corridor Saturday…” The paper also reported about 4,300 motorcyclists rode from the Mesa Riverview Plaza to the Capitol. The total number reported may be somewhat high, but the crowd was dominated by bikers and their women. Black leather, bandana head doo wraps, and tee shirts with provocative political sentiments celebrated the independent streak of citizenry at the price of intimidation for those of a different persuasion. Fortunately, the only guns were part of the military displays and heard from the Western Theater. Several stages offered different music genres. The Arizona Best Stage, sitting beneath the state capitol dome, featured Dennis Rowland and the Extreme Decibel Big Band. We enjoyed tunes from the Count Basie repertoire and Dennis Rowland sang Frank Sinatra songs. Carlos Y Su Moda Nortena Band from Tuscon was playing mariachi music on the Hispanic Stage. Antone Honanie of Kykotsmovi played on the American Indian stage while three Hopi dancers performed the Eagle and other dances. Gabriel Yaiva, a Navajo from Flagstaff, showed off an Alaskan drum before sharing a song. Miss Navajo Nation Crystalyne Curley from Fish Point, Arizona explained the symbols on her crown and sang a couple of songs. Several artists displayed their work. Although Arizona micro-breweries and wineries offered their wares, we decided to forgo eating carnival-type food before drinking in favor of driving to a full service restaurant. The Best Fest represents great free entertainment. Saturday evening’s Phoenix Symphony was one to remember. Scheherazade, Opus 35 by Nikolai Rimsky-Korsakov highlighted the talents of many of the Symphony’s principals. Concertmaster Steven Moeckel, for example, exquisitely played his solo passages in the first movement, “The Sea and Sinbad’s Ship.” The English horn solo in “The Tale of Prince Kalendar” was special as was the virtuosic fanfare passages for trumpet. I especially enjoyed the romantic themes in “The Young Prince and the Young Princess.” The final passage featured fiery and exciting music until the end where the deep resonant sounds from Peter Anderegg’s cello musically issued the verdict that the storyteller will live. The evening’s performance started with Symphony No. 3 in C Major, Opus 52 by Jean Sibelius. This frustrated Finnish violinist composed a difficult, and little played, work for the violins. During the intermission, Michael Christie brought Steven Moeckel on stage to share his perspective on both of the evening’s works and to talk about his solo career having recently returned from playing with the Portland (Maine) Symphony Orchestra and Grand Rapids (Michigan) Symphony. Music director and conductor Michael Christie is to be commended for bringing engaging music to the Valley of the Sun. 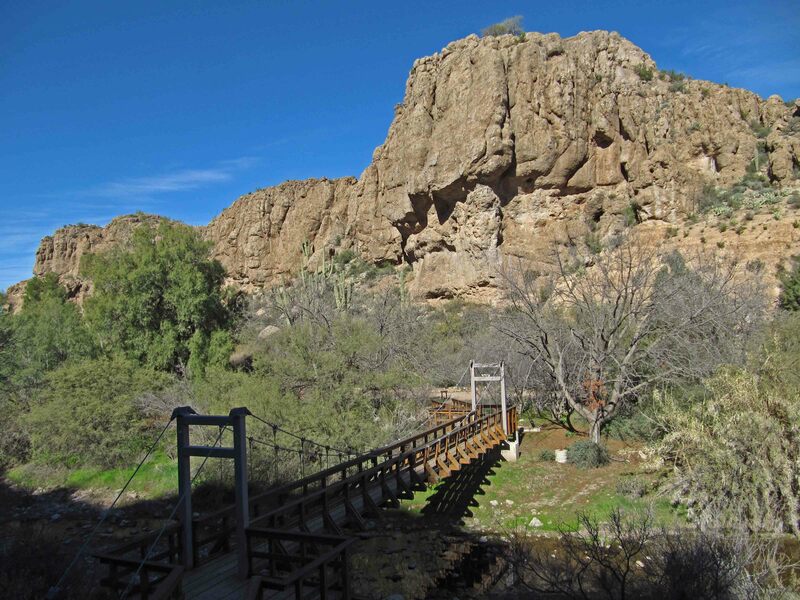 We last visited Boyce Thompson Arboretum on International Migratory Bird Day in May 2010 when temperatures were hotter and more people were on the trails. On this visit very few plants were in bloom and the trails were not crowded. After touring the Display Greenhouses, we strolled the trails in the Chihuahuan Desert exhibit. A beaked yucca glistened in the sun. A huge prickly pear was burdened with fruit. The branched canopy of a palma china reached 20 feet in the azure blue sky. One plot of golden barrel cacti within the Cactus & Succulents Garden featured numerous spherical globes with up to 35 ribs. We noted that the cardon grande, native to northern Argentina, is very similar to the saguaro. Later research revealed that it grows faster than a saguaro. Century plants, I learned, bloom only once but live only about a quarter of a century. As we returned to the main trail a boojum tree caught our attention as much for its name as its long spike. The Picket Post House stands out planted as it is atop a cliff. At the suspension bridge we crossed and hiked the High Trail, a half-mile trek through the Upper Sonoran Natural Area. We finished our visit with a walk through the Demonstration Garden. We then drove three miles east to the historic copper mining city of Superior and decided on our lunch spot based on the number of cars and motorcycles out front. A glorious February outing in Arizona.